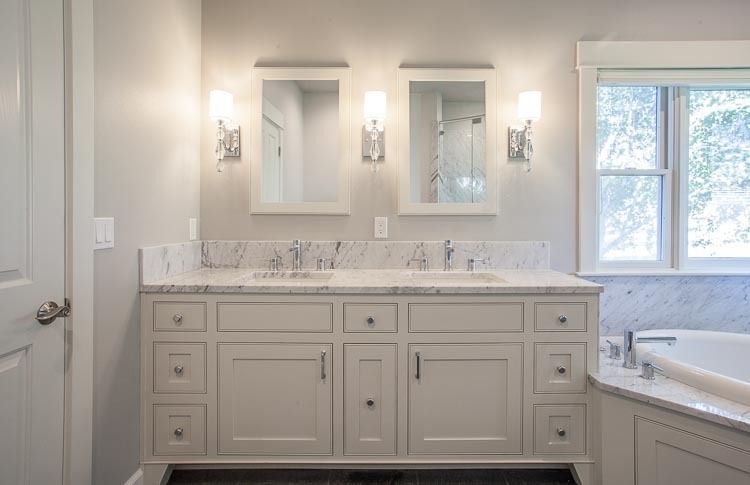 The main objectives in remodeling this bathroom were to increase the size of the walk in shower & change up the materials & colors to suit the new homeowners. A custom interior design for the bathroom involved moving the toilet & borrowing a small amount of space from the closet to provide the significantly larger shower. The clients opted for new light fixtures, new white cabinets to brighten the space, slate floors, marble counter + shower walls & tub deck. The tub was retained & re-set into a new marble deck.. The two framed mirrors lend some softness & charm while the sconces flanking them provide flattering lighting. 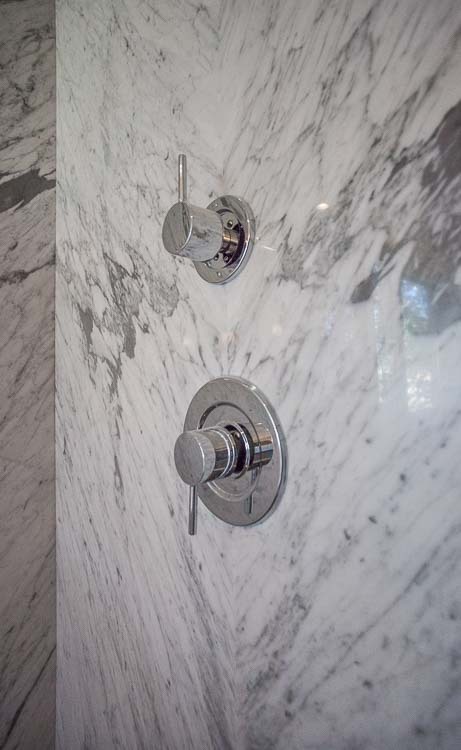 The white marble clad shower is the star of the room, with shampoo niches tucked at the side to keep clutter out of view. A pebble-style floor in the shower provides a non-slip surface for showering. The changes planned in the master bathroom were primarily aesthetic - although we did move the toilet & increase the shower size. The homeowners were excited to discover they could make one large visual impact with very little time & effort: simply removing the divided light (surface-applied) panes from the windows. Painted cabinets brightened the space & the use of larger tiles & slab cut stone clears the clutter of grout lines for a more serene appearance. Updating from brass fixtures to brushed nickel with a frameless glass shower enclosure finishes the look.